When I started to learn WinForm programming, one thing that I wondered was how to create additional window forms on already existing Winform Project. For example I wanted to create a popup window for editing purposes. I knew what code to write that would instantiate a new form but didn't know how to edit that form in the designer. In this article we are going to create a Winform Project from scratch that will contain main form and also one additional regular form which will act as a popup dialog window with OK / Cancel buttons. This popup dialog box will be shown when button on the main form is clicked. When the popup window closes, the main form will check which button (either OK or Cancel) was clicked. Note:In the real world application you most likely will not create these kind of simple Dialog boxes as shown here but would instead just call a static method MessageBox.Show. Create a new project and choose Windows Forms Application. Name the project and click OK. Drag a Button Control from a ToolBox (View > Toolbox). Note:You can also add a control to the Form by double clicking the button in the Toolbox. Now lets add another Form Window to the project. You achieve this by right-click on project name in Solution Explorer and then select Add > Window Form from the context menu as shown below. Add New Item dialog window will appear with Windows Form already selected. Give it a name PopupForm and click Add or just press enter. To give this new window some basic functionality, lets add two buttons to it. Open the form in the Designer and then drag two Button Controls to the form (same way as in step 2). For each of the button we are going to modify two properties. Only thing left is to add the code. We need to create a new instance of popup Form when button on the main form is clicked, so select the main form in the Designer. If it is not opened, just Double-click on Form1.cs in Solution Explorer. In the main form Double-click on OK button that you dragged in step 2. This will automatically create an empty method named button1_Click. This method is going to be called when button is clicked. We want this button to open new popup window, so all the necessary code will be contained in this method. Here we are instantiating the PopupForm class. 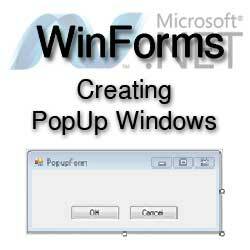 This class was created in steps 3 and 4 when we selected Add > Window Form and named it PopupForm. 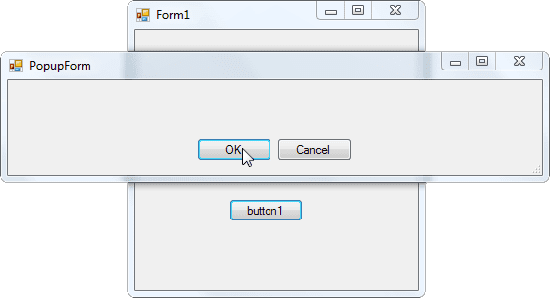 ShowDialog method will open the form as a modal dialog box. This basically means that the user will not be able to interact with the main form until the PopupForm is closed. Another feature of the modal forms is that the code after ShowDialog method will not get executed, you guessed it, until the popup form is closed. Note:In reality the form gets only hidden and can be shown again without creating a new instance of the form. 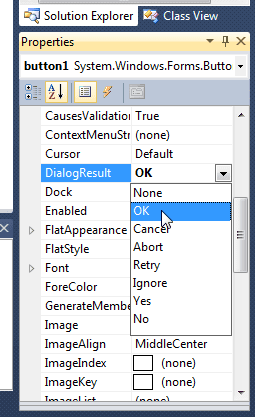 When the form / dialog box closes, it is going to return DialogResult Enumeration value and it will be the same value as the DialogResult property of the button that was clicked. If the button DialogResult property is set to DialogResult.None, the form will not close. Type of variable dialogresult is DialogResult Enumeration, so we compare that variable against the possible values of that enumeration. When we do not need the popup form anymore, we dispose of it by calling Dispose method. Reason for calling Dispose method is that when you click either OK or Close button (X button), the popup form will only get hidden and not closed. Without Dispose() we would create additional instances with every button click on the main form. I hope you found this article useful. If you still have questions, drop me a comment and I might include your problem with the solution in any future update. Yes, this article is basically for those who never added additional forms to their projects. A good article and example. The code implies you can write to 'Console from a WinForm App. I have never been able to make that work, this code not excepted. Any suggestions? Do you have any words of wisdom for the beginner on the workings of 'Delegates'? I never had a need to write to Console from Winform app but one easy way to do this is to right-click on Winform project in Solution Explorer and select Properties, then under Application tab, choose Console Application under Output Type. Regarding the working of Delegates check this article. It explains Delegates in simple terms. I hope you will find my suggestions useful. I'm new to C#, this is a great example and easy to understand. I hope you'll have more article like this, very useful. Thank you for the comment. I'm glad you liked it. A great quick learners guide. Nice article. Helped me to know that I can use a form itself as pop up instead of an user control. Thanks. Thanks! Very useful for beginners, helped me a lot! Thank you for tutorial. It was very useful. I have a more complicated question that may build on your code. I have a main form that upon an event will create and display a child form. I would like to display information in this child form that is constantly changing, for example CPU usage until the user has the data he needs, then it's just a matter of closing the child form as you described. Is it best to use a Form or is is there something else better suited for this purpose? How do I go about continuously updating the information in the child "window"? It was great, but i already have some application which is developed in solution explorer. now i need to link this model to my previous application, can you tell me how. If your application is DLL class library containing WinForms and you want to use those Winforms in another Winforms project, then just add a reference of DLL class library to this WinForms project. Just one more thing: How can I read values put into the popup-window's form after it's closed? All I can think of is storing that data a global variable by the button-click of the popup window. Did I get that right or is there a better way? You can create a property in a popup window and make it accessible in a main form. When popup window is open, it stores the data in a property and after it closes you can access that property from the main form. But how to drag and drop some selected data in the popup window to the base form? When popup.ShowDialog() is in place, we can't access any other base form or any other form if needed. popup.ShowDialog() make us stay on the popup only, we can go to the base form only if we close the pop up. Need some help in this area to drag and drop items. What you need is to show modeless dialog and you do that by calling popup.show() instead of popup.ShowDialog(). Check this MSDN article for more information about modal and modeless Windows Forms. 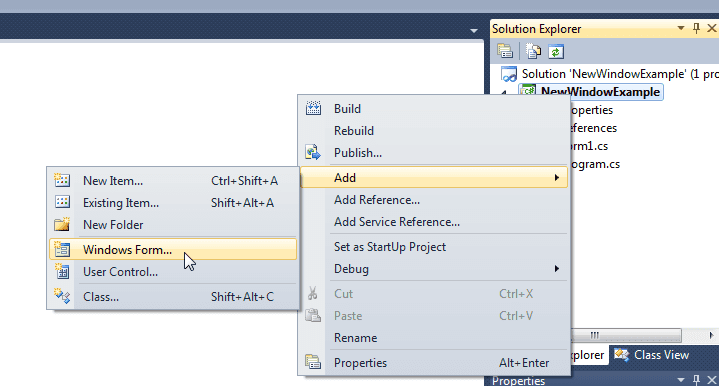 And this MSDN article might help you get started with the drag and drop functionality. Thank you so much for taking the time to post this super-easy example. Good article, but there is no such WinForm add function in VS 2015? What to do? Excellent tutorial for a long-time coder who is dipping into C#!